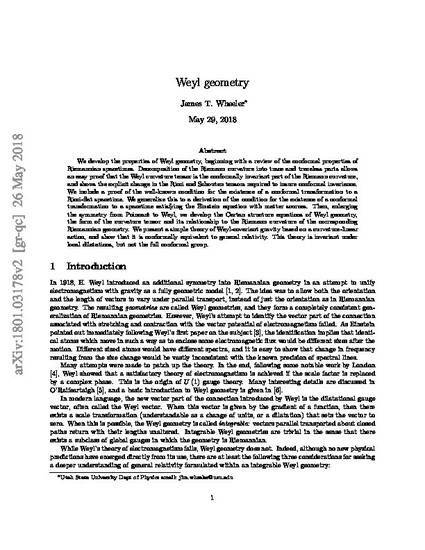 We develop the properties of Weyl geometry, beginning with a review of the conformal properties of Riemannian spacetimes. Decomposition of the Riemann curvature into trace and traceless parts allows an easy proof that the Weyl curvature tensor is the conformally invariant part of the Riemann curvature, and shows the explicit change in the Ricci and Schouten tensors required to insure conformal invariance. We include a proof of the well-known condition for the existence of a conformal transformation to a Ricci-flat spacetime. We generalize this to a derivation of the condition for the existence of a conformal transformation to a spacetime satisfying the Einstein equation with matter sources. Then, enlarging the symmetry from Poincaré to Weyl, we develop the Cartan structure equations of Weyl geometry, the form of the curvature tensor and its relationship to the Riemann curvature of the corresponding Riemannian geometry. We present a simple theory of Weyl-covariant gravity based on a curvature-linear action, and show that it is conformally equivalent to general relativity. This theory is invariant under local dilatations, but not the full conformal group.